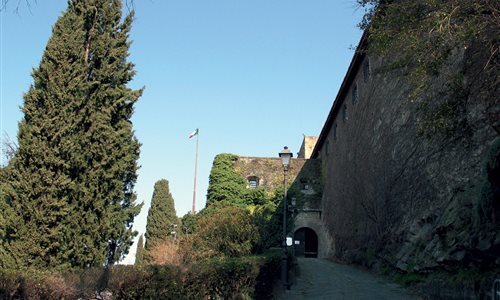 San Giusto Castle stands on a hill of the same name that overlooks the city. The history of this hill is as long as that of the city itself. It is here that the first fortified settlement was built, the predecessor of Roman Tergeste. In 1382 Trieste, worn out by the constant Venetian reprisals, signed the act of Spontaneous Surrender to Austria, under which the city maintained its independence but was protected by an Imperial Captain, and so it was that in 1468 Frederick III ordered the building, at the citizens' expense, of a Fortress flanked by a tower at the top of the San Giusto hill. The three sides of the current triangular perimeter walls of the Captain's House were added over the centuries. The first round bastion was built in 1508, perhaps as a taunt, by the Venetians, who occupied the city for a year. It was followed by the polygonal south-eastern Lalio bastion in 1557, and finally, in 1636, by the third bastion, which completed the fortress. The Castle never experienced significant military activity, and so has endured until today. With its strategic location the ramparts offer stunning views over the city and the Gulf of Trieste. In the museum, housed in the Captain's House, visitors can admire the Late Gothic San Giorgio Chapel and Giuseppe Caprin's sumptuous Sala Veneta. It also contains a rich collection of weapons dating from the twelfth century to the nineteenth. The Lalio Bastion houses the Lapidario Tergestino, containing around 130 inscriptions, bas-reliefs and sculptures that have helped to reconstruct the history and appearance of Roman Tergeste. At the entrance you can admire the original statues of "Mikeze and Jakeze", the two automata that mark the hours on the bell tower of the Trieste Town Hall.